The chicken in this dish tastes fantastic in the five spice sauce. When it comes to cooking this dish, it’s very flexible for using any Chinese vegetables you like. It’s quite versatile, suitable for going with steamed rice or porridge. You can cook the chicken in five spice sauce in a day in advance, cool it in the refrigerator, then reheat it and cook some fresh vegetables as you need it. The flavours will intensify overnight. Slice chicken crossways into thin 4cm (1 1/2inch) lengths. Prepare seasoning. Use teaspoon to mash and mix chopped raw sugar well. Rinse baby bok choy and drain well. Wipe dry with kitchen papers. Cut into 4cm (1 1/2inch) sections. Separate leaves and stalks, set aside. Heat 2 tablespoons of oil in a wok (or frypan) over high heat. 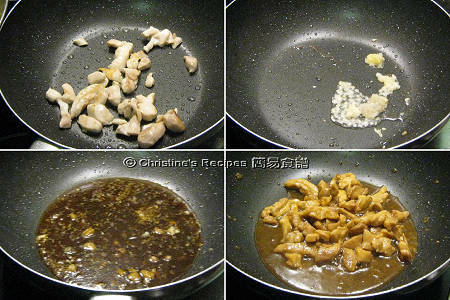 Add chicken pieces in small batches and cook until browned. Drain and set aside. Heat 1 tablespoon of oil in a saucepan. Add the garlic and shallots, then sauté for about 2 to 3 minutes, or until fragrant. Add the seasoning and stir well. Add the chicken and bring to the boil. Reduce the heat and simmer gently for about 15 minutes, or until the chicken is tender. Add the stalks of baby bok choy, cook until they begin to be softened. Then add the leaves. When the leaves of bok choy are cooked, it’s done. Season with salt if necessary. 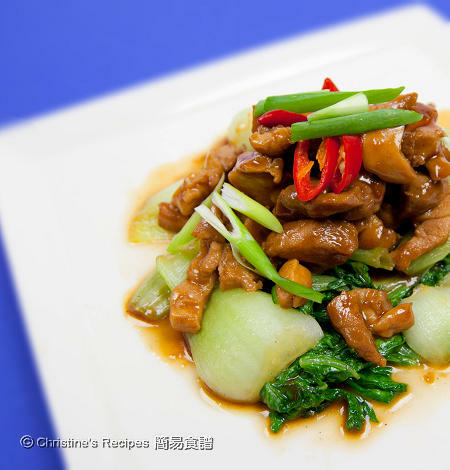 To serve, place baby bok choy on a plate, sit the chicken pieces on top and spoon on the sauce. Garnish with sliced spring onion and chili. The taste of fish sauce is salty and varies from brands to brands. You have to adjust the amount according to your preference. While cooking the baby bok choy (picture shown above), some water will release. You might not like it dilute your sauce, thus wipe them really dry before cooking. 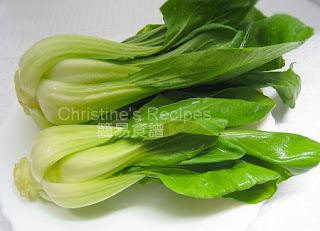 You can replace the baby bok choy with Chinese broccoli if you like its crisp texture. This looks fantastic and the sauce is so flavorful. I definitely need rice for this. It seems spicy recipe! I would like to try it. Thanks for this recipe. I adore 5-spice flavoured food. Pleasant and flavourful. I like nice and simple dishes like this. Very homey. Hi Christine - I love the idea of something that tastes better the next day! Thanks for sharing the recipe! You have my favourite vegetable there....bok choy! Love cooking chicken with 5 spice. This dish has to be very flavourful and delicious. Great with rice. This does look warm and comforting and packed with flavor. I love baby bok choy and then could just add vegetables to my hearts delight. Great recipe! Looks great, five spice is a family fav, here. I love braised chicken thighs, so flavorful, and then you added five-spice making it delicious! Yum! I've never used five spice powder before, what are the different spices used? Cooking the chicken beforehand to intensify the flavors sounds like a win-win situation: you get a good meal and it's prepared! I just got five spice and would love to make this recipe, sounds excellent! Yummy! You post these delicious recipes I can't resist. I am glad to stop by. Christine - this looks super yummy! Your photography is getting better and better! Congrats. Thanks for your comment, really encouraging. You know what? Your photos inspire me a lot. I'm still at the early stage of learning how to take food photos! Perfect timing, I just got some chicken thighs and bok choy - this sounds so perfect - I have a renewed appreciation for 5 spice powder - I think someone over did it and I found it way too cloying, took me a while to get over that association. Simple though, you have made the dish look inviting. Beautifully shot and I bet it is very tasty too! Oh! What a nice chicken dish...like it with veggies, this way you have them all in one dish :-) Great pictures!